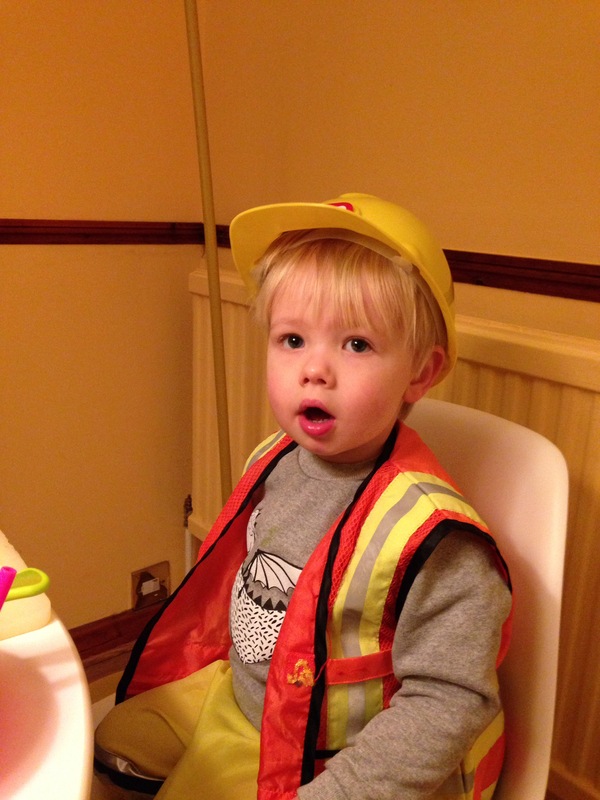 Bert, determined sauce avoider, came home from pre-school raving about the ‘brown, bumpy sauce’ he’d had there. Questioning and detective work revealed it to be sausage casserole. Desperate for some sauce in our lives, I quizzed him intensely, thought hard about what makes the best sausage casserole (and what makes sauce brown and bumpy), did some research and tinkering and came up with this. Meanwhile, Bert’s been perfecting his joke delivery technique. I don’t know, what do you get? Stewart Lee has made a career out of this. But all we have is an uneaten portion of sausage casserole. He had pasta and Parmesan cheese, we had this. Heat the oil in a large saucepan and soften the onions. Add the carrot, celery and garlic and cook gently till the carrot is soft and pale orange. Add the sausages and cook till browned. Then add everything else, bring to a fast simmer, reduce the temperature and cook for 30 minutes, stirring now and then. Serve with pasta, buttery mash or crusty bread. Me to Bert in the bath last night: Was I being grumpy today or were you being naughty? Bert (with an air of diplomacy): A bit of both. Bert (accusingly): You were being bossy. Me: That’s my job as your mum. Bert (carelessly): I was just doing my own thing. As part of my ongoing, inadvertant project to pointlessly recreate processed food classics, tonight I accidentally threw together home-made tinned Heinz spaghetti – in a good way. We had ours with meatballs (my intention was to veg-up a tomato sauce for meatballs) and grated parmesan. This makes enough for a big bowl spare in the fridge – as a veg-heavy pizza base topping or to start your own canned spaghetti business. Or just do your own thing. Add the olive oil to a saucepan on a medium heat, cook the celery and pepper till softened, add the garlic and cook for a minute, then add the sweetcorn, fresh tomatoes, tinned tomatoes and seasoning. Bring to a simmer. Put the spaghetti on to cook. Stir the sauce now and then. When the spaghetti’s almost done, puree the sauce and add a dash of cooking water from the pasta. Drain the spaghetti and stir it into enough sauce to coat it, stowing the rest away for another occasion. In other news, we had sausage pasta for dinner. Fry the veg gently in olive oil till starting to soften then tip in the tomatoes and water, and season. Simmer for 15 minutes. Meanwhile de-skin the sausage and break into pieces into a hot pan with a splash of oil in. Add the fennel seeds and cook on a very low heat while the sauce cooks. Then blend the sauce, add half to the sausages (fridging or freezing the rest for pasta sauce or pizza sauce), stir a spoonful of cream into the remainder and simmer on a very low heat while you cook the pasta. Add a splash of the drained pasta water to the sauce, stir through the cooked pasta till its coated in sauce and you’re good to go. Sprinkle on Parmesan at the table. 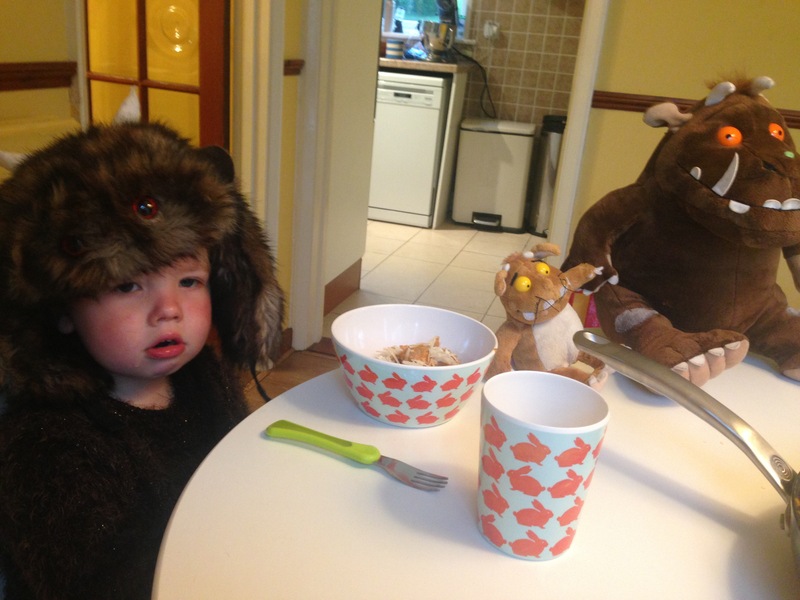 Eat naked from the waist down, dressed as the Gruffalo waist up. Looks and tastes like standard pizza sauce (maybe a little sweeter), turns pizza into a vaguely healthy meal for small builders who spent all afternoon methodically digging a tiny road into the gravel on the drive. I can’t remember the last time I saw my child without fancy dress on, other than in the bath. Pre-heat the oven to gas mark 6/ 200 degrees. Slice the veg into 5cm batons, drizzle generously with oil, season and roast for about half an hour. Then tip the lot, oil and all, into a pan with the tomatoes, balsamic vinegar and sugar, cooking gently for 10 minutes. Blend to a puree, check seasoning and spread on rolled out pizza dough before adding mozzarella and any other toppings (ham for me, road dust for him). 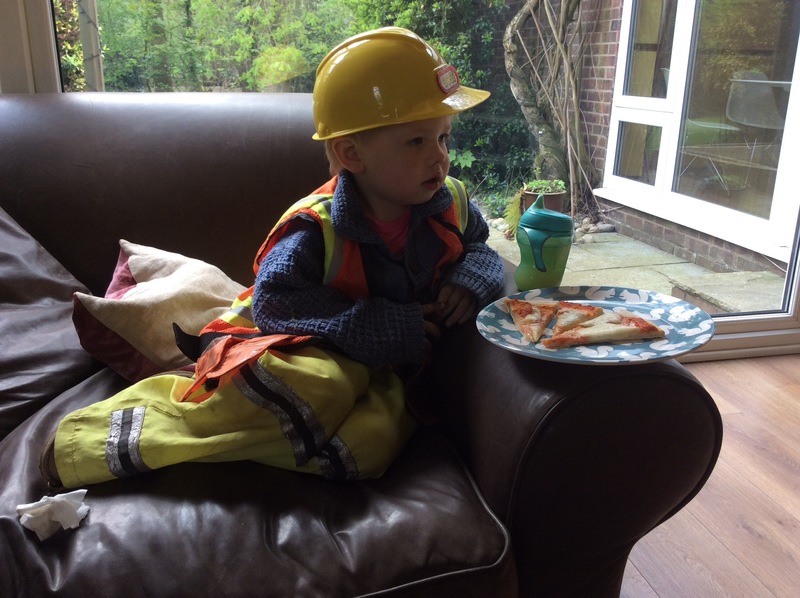 Bert breakfasted as a fireman, shopped as an astronaut and dined as a builder. Not every man can carry off a silver jump suit. This is based on a Nigel Slater recipe but I rarely make a tomato sauce without adding extra veg. I had mine with green salad (Bert mimed being sick) and we both had grated cheese on top. Gently sauté the onion in a little olive oil. Add the garlic, carrots and celery and cook till the onion’s transparent, then tip in the passata (or tinned tomatoes, if you prefer). Bring to a fast simmer then turn right down and cook on a gentle heat for an hour to an hour and a half. At the end of the cooking time put the pasta on to boil. Puree the sauce and add the drained chickpeas and cream, seasoning to your taste. Heat through for five minutes then stir through the drained pasta. If you don’t have a blender, you could finely chop the onion, crush the garlic and grate the veg. Serve with grated cheese and green leaves (bleurgh). This is a version of a Jamie Oliver recipe. 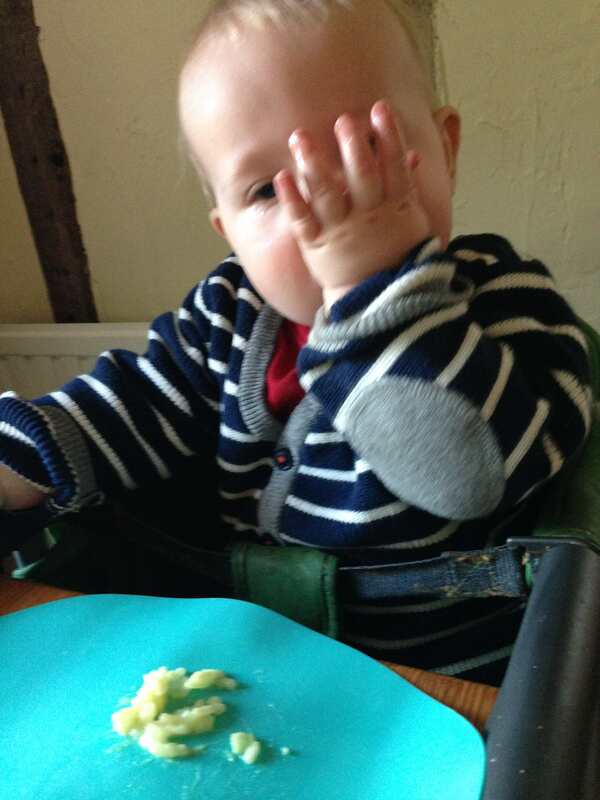 Bert spurned it, but I put that down to teething (teething which had miraculously disappeared by the time he was offered his first chocolate milkshake later). Not sure how we’ll justify his evil behaviour when those last two molars have come through. Drizzle the veg, cherry tomatoes and garlic with olive oil and roast in a hot oven (220 degrees or the top of the Aga roasting oven) for about 40 minutes, till soft. Set aside the garlic and tip the veg and juices into a pan, squeezing the soft garlic out of its papery cases into the veg. Add the tinned tomatoes and water and blitz with a blender to a nearly smooth onsistency. Stir the pasta through and bring the lot to a simmer on the hob, cooking till the pasta’s soft (about 7 to 10 minutes). Serve with a blob of pesto and a sprinkling of grated cheese. This did not get the dramatic ‘mmmm’s that the chocolate milkshake did. At least, not from Bert. Oops, we’re having a barbeque for dinner and forgot to start it in time for Bert. Saute the onion, celery and garlic in the butter till soft and translucent then stir through the rice. Add the liquid bit by bit till it’s absorbed – it will take about 20 minutes. Throw in the saffron with the first addition of liquid and add the pepper and cheese at the end. We’re using the (pretty tiny amount) of leftovers for risotto balls for Bert’s lunch one day this week. They’d be nice with tomato sauce in the middle.